Over 17% of new car buyers picked grey last year, and it’s now the third most popular tone in the UK. But how many different types of grey can there really be? Quite a lot, actually. For reference ESM’s Editor has never actually seen Fifty Shades of Grey, or read any of the books. However, he surmises that the plot revolves around a man who treats his interior designer quite badly, whilst she struggles to pick the right grey tones for his house. Plus, the lead character insists on one room painted red, in a tribute to Changing Rooms from the 1990s. Beyond that, who knows what happens, other than inspiring us to seek out fifty shades of grey paint offered on new cars. We’ve taken these directly from the configurator websites for the respective manufacturer. As a result, the quality of some images is not the best. In the case of Skoda, it’s truly dreadful; like 8-bit Nintendo retro. We’ve tried to accommodate as many different brands as possible, but other greys are available. We’re also not sure how some of these can even be classed as grey in the first place. #2 – Magnesio Grey Matt – A £1,000 option for Giulietta Veloce. #4 – Suzuka Grey – Not really grey, is it Audi? #6 – Daytona Grey matt – A £5,675 option for the RS7. #10 – Oolong Grey – Oolong is a traditional Chinese tea. Fact. #11 – China Grey Solid – Non-metallic a bold choice on a DB11. #15 – Light Grey Satin – Matt finish, also available in Dark Grey Satin. Which is darker. #16 – Sophisto Grey Xirallic – Xirallic? Aluminium and titanium bits for extra shimmer. #20 – Shark Grey Metallic – No real sharks are harmed in the making of this paint. #21 – Grigio Silverstone Opaco – Opaco means a matt finish. #23 – Grigio Ingrid Metallic – Not really grey. Named after Ingrid Bergman. #28 – Ceramic Grey – We imagine Ron Dennis used to really like grey. #29 – Grigio Metallic – Italian makes everything sound sexier, even grey. #31 – Magno Mountain Grey – A £1,795 optional matt finish. 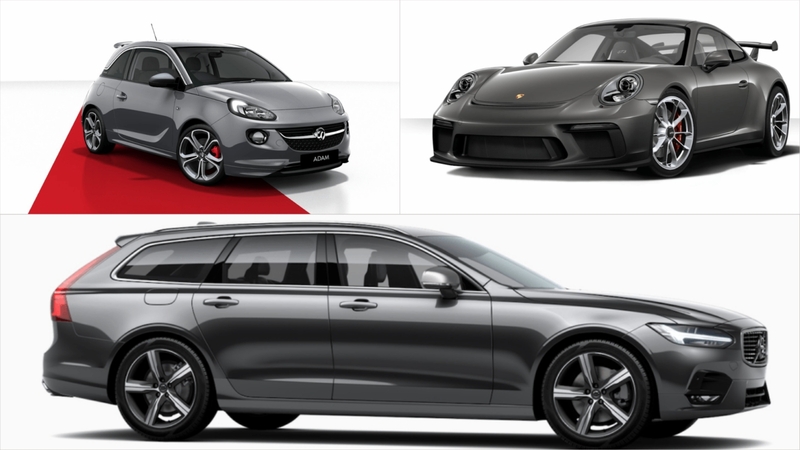 #36 – Agate Grey Metallic – ESM’s editor would spec a Porsche in this. With red leather. #38 – Carpathian Grey – A pricey £1,450 premium metallic paint. #43 – Grey Metallic – Well done Toyota, for calling a spade a spade. #45 – Shades of Grey Metallic – Hat tip to you, Vauxhall. Cleverly played. #50 – Osmium Grey – So deep, so inky, so Volvo. For the Fifty Shades Darker version, decrease the contrast setting on your device and start from the beginning. Colours may appear different in real life.